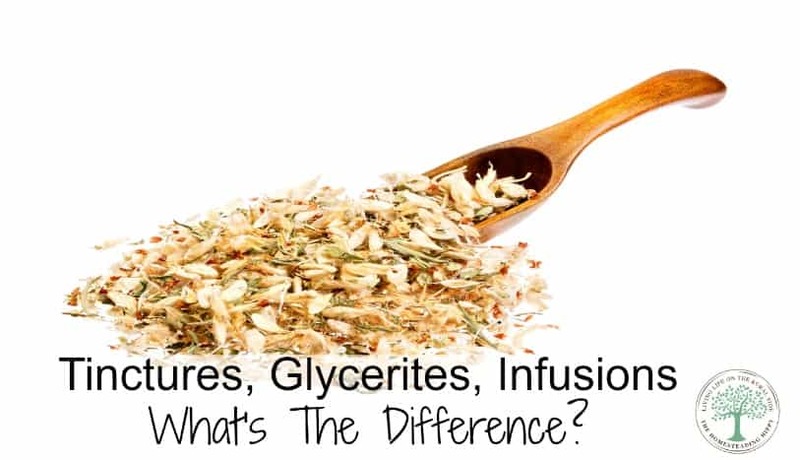 Tincture, Glycerite, Infusion-What's The Difference? Herbal tinctures, glycerites, and infusions are a great way to get the medicinal properties of herbs into a usable form. Your herbal medicine cabinet is probably already full of different herbs in each of these forms. You will get some of the best qualities from each herb, depending on how you use them. So, what is the difference between a tincture, a glycerite, and an infusion? Simply add your choice of herbs, 2-4 grams by weight, to a large tea pot or mason jar. Add 8-16 ounces of boiling water and allow to steep for 5-10 minutes. It is best if the jar or kettle is covered. Finally, strain the plant matter, and sweeten to taste. All of these herbs are safe to use (the only exception is chamomile if you are allergic to ragweed) and are great for colic or upset tummies. A glycerite is a good choice for those who do not wish to use alcohol in any form. Making glycerite involves taking the dried herb and infusing it in a mixture of 75% glycerin and 25% water to extract the herb qualities. Glycerine is a sweet, vegetable based medium that can make “the medicine go down” easier for kids. Most often, glycerites are a 1:2 ratio of dried plant matter to a glycerin/water mixture. This means if you are infusing 10 grams of dried herbs, you would add 20 ml of liquid in the ratio of 15 ml of glycerine and 5 ml of water. (keep in mind, 5 ml is equal to about a teaspoon). You will often need to “crush down” the herbs into the liquid as it may not seem like enough to cover them. Tinctures are made generally the same way as glycerites. You want to measure the herbs by weight when making them for medicinal purposes. The reason for this is that some herbs, while useful, can be toxic in high concentrations. You also want to get the right ratio for the “job” you need it to do. There’s nothing worse than taking an herbal tincture to help with cold symptoms, only to find you aren’t taking enough to do anything, right? As you can see, tinctures, gycerites, and infusions are all beneficial to the herbal medicine chest. What are some of your favorite ways to use herbs?